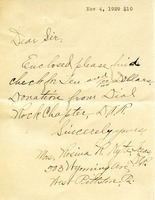 Receipt for J.M.Tallock for $100.00 donation to Berry School. 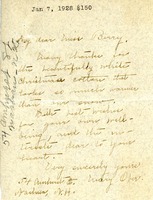 Ella G. Stephenson writes to thank Martha Berry for sending Christmas cotton bolls, expressing the hope to one day see cotton growing in the fields, and encloses a contribution. 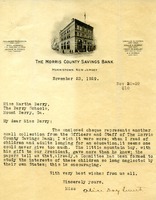 Letter regarding donation to Berry from Officers & Staff of Bank. Caroline W. Paige writes in thanks for the Christmas cotton and encloses a contribution of $150. 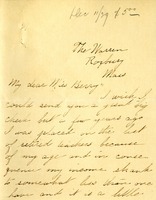 Mary Ober writes in thanks for the Christmas cotton. 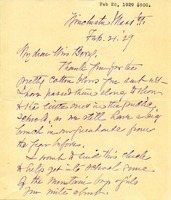 Emma L. Merrill writes to say that she wishes she could give more, but that as a retired teacher her donation of $5 is all she can afford. 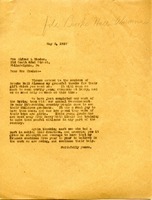 Contribution record for Miss Gena Russell Harding, Washington, DC. 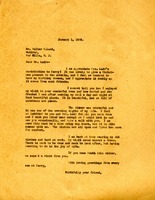 The letter notes a gift of $15 from the Erskine-Perry-Sears Chapter.